The ability to get in and out of the shower is taken for granted by most, but not by all. There are many people who for one reason or another cannot negotiate the high curb of a traditional shower, and they certainly can’t get into a bath tub shower. For these folks the shower curb or tub wall do in fact form a “barrier” that needs to be gotten rid of. I’ve been constructing barrier-free showers, also called “walk-in” showers or “roll-in” showers, for a number of years. Some of them are more accessible than others. It depends on two things: the needs of the customer and the structural characteristics of the house the shower is being built in. 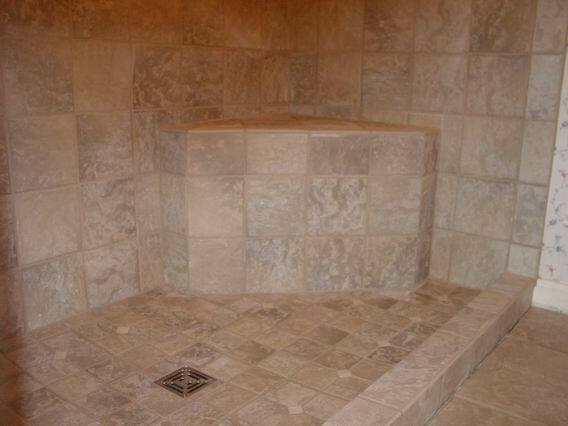 In many cases, there is no way to build a completely “curbless” shower stall. A low curb will have to be incorporated just to keep the water in if nothing else. This is especially true when the shower being converted is in a tub alcove where the depth of the new shower is limited by the location of the toilet (which is usually directly in front of the tub/shower alcove). There won’t be enough room to build a ramp or “speed bump” going into the shower and still have enough space left for the actual business of showering. In these cases the curb is kept low — about four inches from bathroom floor to the curb top. This curb is less than four inches tall and a little over three inches thick, certainly easier to negotiate than the traditional curb which might be seven or eight inches tall and five inches thick. Where more free space is available it is often possible to build a curbless shower. 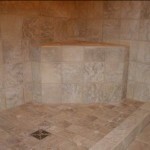 Over concrete floors this might be accomplished using the Schluter Kerdi-shower system. The Kerdi system entails the use of a special membrane and drain combination which makes it possible to eliminate the conventional shower pan liner and to thus gain about an inch of vertical space. An easily negotiated hump is constructed at the front of the shower, and a shower curtain is hung just to the inside of it. This arrangement keeps most of the water in the shower. This shower is about four feet deep. There is plenty of room for the “hump” that keeps the water in the shower. The shower curtain hangs to the floor between the inside of the hump and the front edge of the bench. Side view of “hump.” A wheel chair or wheeled shower seat can easily roll over this. It is not feasible to attempt to lower an existing concrete slab floor. Doing so destroys the structural integrity of the slab. Reinforcing would have to be cut, and post-tension cables get in the way when that type of slab is encountered. It’s much better to live with the hump at the shower entrance that using the Kerdi system (above) entails. Over wood subfloors a curbless shower is constructed by lowering the sub-floor to make room for the mortar that forms the shower floor. 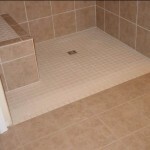 Often the floor can be lowered enough so that no hump is needed at the shower entrance. Instead the floor simply begins sloping toward the drain. This is not always the case, though, and occasionally the hump will still be required at the entrance. 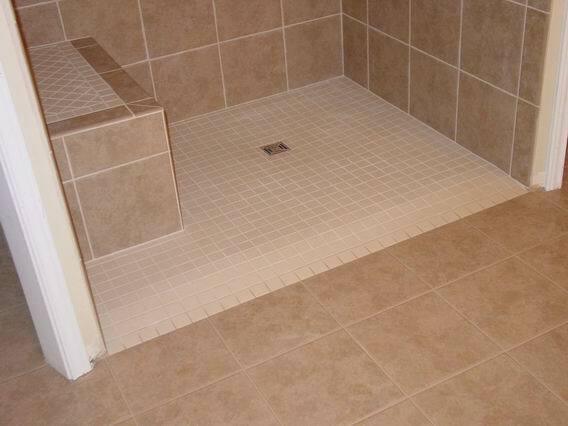 Finally, the entire bathroom floor can be converted to shower floor. Everything is removed from the room and either eliminated or later reinstalled on top of the new floor. Typically you’ll end up with a wall mounted sink, a toilet and the shower itself. 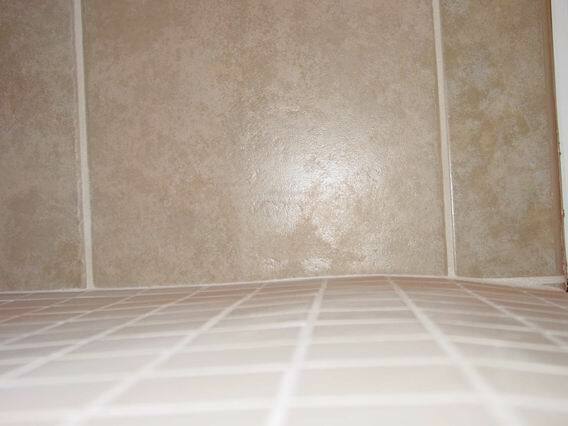 The walls of the bathroom are covered with tile at least halfway up in the areas outside the shower. The shower can be used with or without a curtain, since everything in the room will be impervious to water. In concrete slab construction this will entail raising the new floor as much as two inches above the finish floor of the house, and this means that some sort of ramp will have to be constructed outside the bathroom. Wood subfloors can usually be lowered enough as to not require the ramp. Still, though, a low threshold will be needed at the bathroom door. Regarding shower curtains, in my opinion they should be used in place of glass doors. Glass enclosures present more of an impediment than do showers which are completely open at the front, even if those showers have curbs. And using a curtain imparts an added advantage. When it gets filthy you can through it away and get a new one. You won’t be doing that with your $700 to $2,000 glass enclosure. Grab bars are an important part of nearly every accessible shower, and they should be planned for ahead of time so that appropriate backing materials can be installed in the walls. For more information on grab bars, please see Grab Bars. Everything I’ve discussed above pertains to remodeling, which is mostly what I do. Everything has to be adapted and retrofitted. In new construction, accessible showers can be planned and constructed with relative ease. 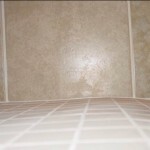 Concrete and wood subfloors can be depressed in the areas where showers are to be built. Additionally, doorways can be wide enough to easily accommodate wheelchairs. Building barrier-free bathrooms and showers is a good idea whether they are needed or not. Properly designed, they don’t take anything away from the appearance of the bathroom, and they are certainly convenient. I mean, it’s a pretty cool idea to be able to just walk into your shower without having to step over anything. And who knows when someone may be required to roll in?